I am a terrible blogger, I love to read, but I hate to write! Occasionally, though, there are things that are worth writing about. We are starting a new program at Hope Rising Christian Academy- Family Fridays! Every Friday our principal, Jeff Altea, and I are visiting the families of some of our 100 school children. We take them some of our cook’s homemade bread and ask about their families and their needs. We want our parents to know we care about them, are concerned with their needs, and are praying for them. 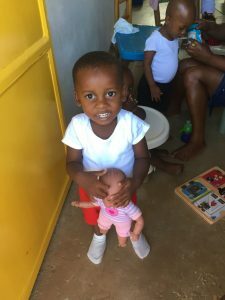 I wanted to write this post so people can get to know our beautiful children and share in the blessings God has given us in working with them and their families. This past Friday we started with Wilney Gene and Jeffrey Destin. Wilney is three years old. He is an only child and has the sweetest smile in the world. 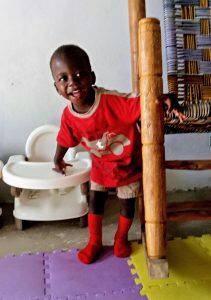 Wilney lives with his parents in the community next to us called Casalle. After talking to his parents, his mother asked us to pray that she would remain faithful to the Lord and follow His directions in all she does. Such a sweet request and one we all could benefit from! Please join us in praying for Wilney and his young family. Jeffrey Destin is two years old. This is his second year at HRCA. He lives in the community behind us and has two older brothers that he looks just like. After talking with his parents, we asked them how we could pray for them. Their request was simple, they asked us to pray for their house. Their roof leaks and the day we visited it was raining. Such a practical thing, not safety, or success, or more money, just having a dry spot to lay their heads. It made me think, what good does it do to go out and tell people we love them and care about them if we only leave it at that? The bible speaks about this in James 2:14-17. I know we cannot meet every need we encounter, but we can try to meet as many as possible. A sheet of tin is relatively inexpensive, but the benefits it would bring to this family are priceless. Therefore, we will be buying a sheet of tin! This first experience has taught me many things. As usually happens, I believe Jeff and I were blessed more that we brought blessings to the families we visited. Secondly, I am excited about the possibility of meeting some of our families needs. If anyone wants to join us in this, they can go to hrch.org and make donations towards the needs mentioned in these posts. With blessings like these to share, I may become a blogger after all.